If you are having trouble finding that perfect gift for your favorite client or the person who has everything? Well, look no further. Give the ultimate TABASCO Gift. Filled with spicy treats, including everything from Chili to Steak Sauce and even spicy snack treats, this basket is sure to "warm" the heart of its recipient. 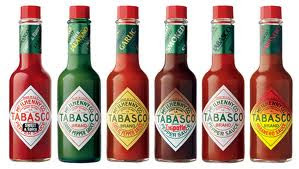 It also includes the TABASCO Family of Flavors pepper sauces: Original Red, Jalapeno Green, Chipotle, Garlic, Habanero, as well as Cheez-its, woodchips for the grill and much, much more. Includes galvanized tub.